Five years since Arrested Development made its improbable comeback—thanks to Netflix’s then-nascent foray into original content—the verdict on its fourth season, its mere existence miraculous, is a shrug. When Netflix announced Arrested Development as part of its first slate of original content back in 2011—which included House Of Cards, Orange Is The New Black, and Lilyhammer—Arrested Development generated all of the headlines. But House Of Cards and Orange Is The New Black sparked all of the conversation. In the ensuing years, we’ve heard Netflix wouldn’t do more episodes, then no, its return was inevitable, that it was being written, that it’d be part prequel, etc. Once Netflix finally announced the fifth season almost exactly a year ago, the details started to trickle out, including co-star Will Arnett saying the new episodes would be “much like the original broadcast series”—i.e., not season four’s non-chronological, character-focused episodes that fans knew and tolerated. Season five is 16 episodes, half of which arrive May 29 and the other half coming sometime this year. While they return to Arrested Development’s traditional format this time around, the show’s timeline remains a little murky at first. When episode one opens, Michael Bluth (Jason Bateman) is estranged from his family and working at a Google stand-in called Search, but—much like the series premiere—the episode flashes back to the immediate past. The extra layer this time around is that the “present” happens to be 2015, which gives season four’s border-wall subplot—who knew that’d be a real thing?—an extra boost a couple episodes later. That said, it takes a couple of episodes for things to get going. The first two episodes spend their time recapping Michael’s estrangement from his family, and it’s not until episode three that the thematic momentum picks up. 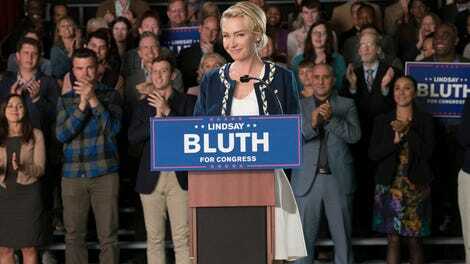 The Bluths come together for Lindsay’s Congressional run—against Lucille Austero, a.k.a. Lucille II, still mysteriously missing—but Arrested Development doesn’t shift its focus to politics. If anything, the show almost immediately pushes Lindsay’s campaign to the side. Portia de Rossi, who plays Lindsay, disappears after episode five, her campaign referenced only in dialogue as the Bluths plot against each other for reasons that aren’t entirely clear. Convinced his family is trying to teach him a lesson, Michael tries to stay one step ahead with his own scheme, and lies upon lies stack up for everyone involved. The motivations of each character feel beside the point; when have the Bluths ever behaved rationally? The fun lies in watching how their plans inevitably collide and fall apart. Tangled is a good place for Arrested Development to be. That may not seem like the case after season four, whose numerous plots were made additionally confusing by the non-chronological episode order, but season five feels more cohesive, like the Bluths are all mixed up with each other, not on their own tangents. And maybe it’s the placebo effect of having the show’s traditional format back, but season five has the rhythm season four lacked. Season four’s structure, such as it was, required a reset at the beginning of nearly every episode. Season five moves from point to point, building on and riffing off what came before, and Arrested Development feels like its old self again. More important, season five is funny, and gets funnier as it proceeds. The first episode has a lot of heavy lifting with exposition, but lands enough laughs to not make fans nervous. The episodes offer a bounty of the clever wordplay that made Arrested Development so quotable, and some funny scenes that stand with the series’ best. To give too much away would spoil things, but Tobias Fünke (David Cross) proves to be the surprise MVP of the first half of the season. His divorce from Lindsay pending, and his role as Lucille Bluth’s therapist ending, Tobias struggles desperately to remain part of the Bluth family by literally trying to fill in for the ones who aren’t present—a clever way to both give the character something to do and alleviate the absence of others. At various points in the first seven episodes, Tobias pretends to be Michael, George Michael, Buster, and in one standout scene, even Michael’s deceased wife. Kyle Mooney joins as Tobias’ even-less-qualified scene partner. As usual, Michael and George Michael get lots of screen time, as does Gob Bluth (Arnett), who’s in the throes of a sexual-identity crisis following his night with Tony Wonder (Ben Stiller) in season four. Gob’s frantic attempts to cover up his no-longer-latent homosexuality deliver some laughs, especially when he seeks help from a closet-organization company in episode seven. Maeby Fünke (Alia Shawkat) also enjoys a lot of screen time with her latest scheme, living in a retirement community. Transparent fans will recognize the location as the same condo complex where Shelly Pfefferman (Judith Light) lives, an inadvertent nod to Shawkat’s recent run on the show and co-star Jeffrey Tambor’s former gig. Tambor also gets a lot of time, though viewers uncomfortable after the allegations of sexual harassment against him will at least enjoy a couple of quick, sharp jokes from Ron Howard’s voice-over the first time George Sr. appears on screen. Ron Howard’s narration remains reliably clever, but season five makes the same mistake as season four by including Howard as a character. There are numerous inside jokes about Imagine Entertainment that’ll kill among the Hollywood set who speak Variety’s slanguage, but they add nothing to the story. Worse is Howard’s acting, which entails seemingly looking off-camera at cue cards and struggling to stifle a grin. He’s clearly having a good time, but he does his best work in the VO booth. Season five looks less cheap than season four, with some exceptions. The exterior shots of the Bluth model home appears to be a scale-size model enlarged and dropped in front of background scenery. An exterior of the seniors’ community where Maeby lives looks like the work of someone learning Photoshop’s clone stamp for the first time. Some reverse shots in a scene with Howard are clearly shot with a stand-in on green screen, which the show still hasn’t figured out how to use. Season four had some comically bad green-screen moments, and while nothing in season five’s initial episodes is quite that bad, some of it is distractingly off. Still, it’s a miracle that these episodes even exist. Back when season four arrived in 2013, Netflix planned to spend a “single digit” percentage of its content budget on five original series that year. In 2018, it’s going to spend $8 billion on 1,000 original series and films. Few would argue Arrested Development needed to be part of that content onslaught, but if the show stays this strong, viewers will be glad it is.